Albin Egger-Lienz (1868–1926), The Cross (1901), oil on canvas, 143 x 171.5 cm, Museum Schloss Bruck, Lienz, Austria. Wikimedia Commons. One of the admittedly flawed measures of the ‘importance’ of an artist is the strength and extent of their influence. In Ferdinand Hodler’s case, this is difficult to assess because of our current limited insight into the arts in central Europe in the early twentieth century. Few people outside Austria, for instance, have heard of Albin Egger-Lienz (1868–1926), who at the time was regarded as being as important an artist in Austria as Gustav Klimt. Despite Egger-Lienz’s protestations, there can be no doubt that Hodler’s paintings were a major influence over his art. In this article and its second, concluding part, I hope to show you how. Egger-Lienz was born close to the mediaeval town of Lienz in the Austrian Tyrol, in the south-west of the country. Initially named Ingenuin Albuin Troja, he was the illegitimate son of a local church painter and photographer, and the daughter of a farmer. He first learned to draw and paint with his father, before going on to more formal tuition from other artists. In 1884, he started studying at the Academy of Fine Arts in Munich, Germany, and was based in that city until he married in 1899, and moved to Vienna. Egger-Lienz arrived in Vienna shortly after the Secession, but decided to ally himself with the conservative Künstlerhaus. While there, he spent quite long periods in Ötztal, in the Austrian Tyrol. Albin Egger-Lienz (1868–1926), Saint Sebastian (1887), oil on canvas, 140.5 x 95.5 cm, Schloss Bruck, Lienz, Austria. Wikimedia Commons. Many of Egger-Lienz’s surviving early paintings have religious motifs. 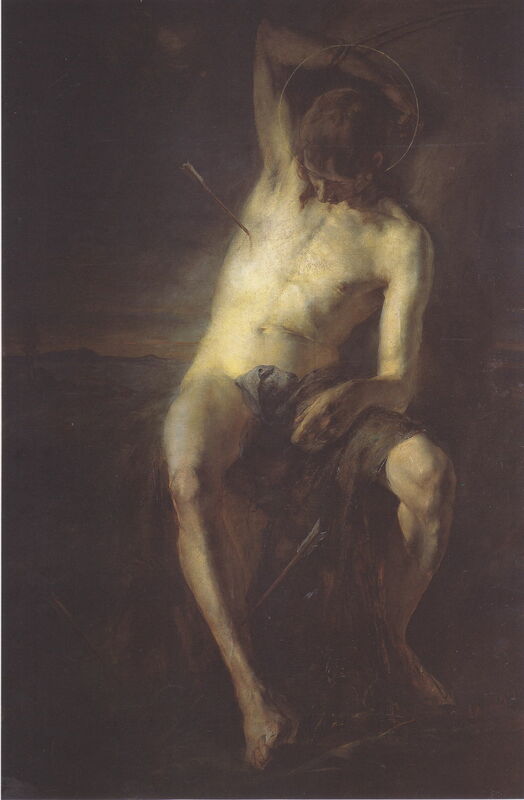 Saint Sebastian was painted in 1887 when he was still a student in Munich, and is a dark and relatively objective treatment of a widely-shown martyrdom. 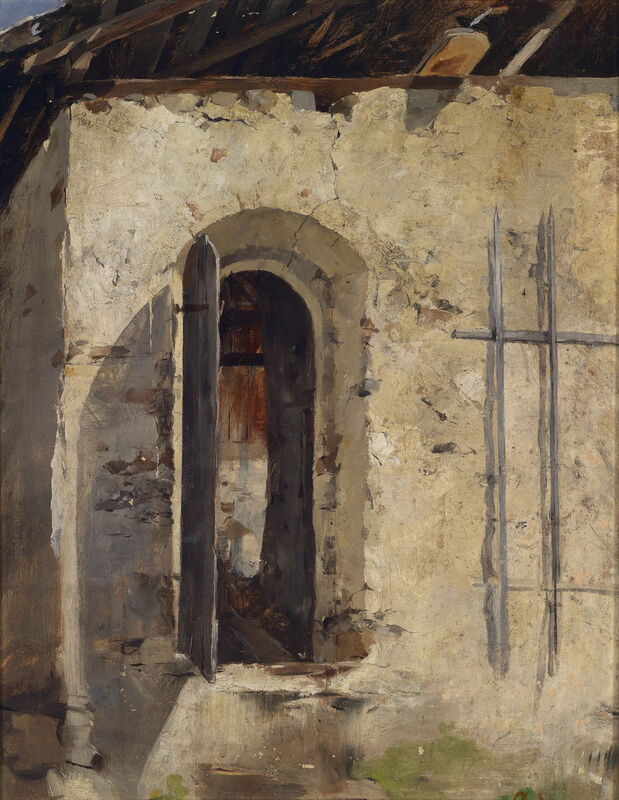 Albin Egger-Lienz (1868–1926), The Gate (c 1890), oil on cardboard, 50.8 × 39.5 cm, location not known. Wikimedia Commons. During his time in Munich, Egger-Lienz returned to the Austrian Tyrol, painting there most summers. The Gate from about 1890 shows the entrance to the grainstore in the Tammerburg, one of several old castles in the middle of Lienz. Although I can find no reference to him painting en plein air, this appears at least to have been started in front of the motif. Albin Egger-Lienz (1868–1926), The Church Choir of Lienz Parish Church of St Andrä (1890), oil on canvas, 100.5 x 122 cm, Schloss Bruck, Lienz, Austria. Wikimedia Commons. 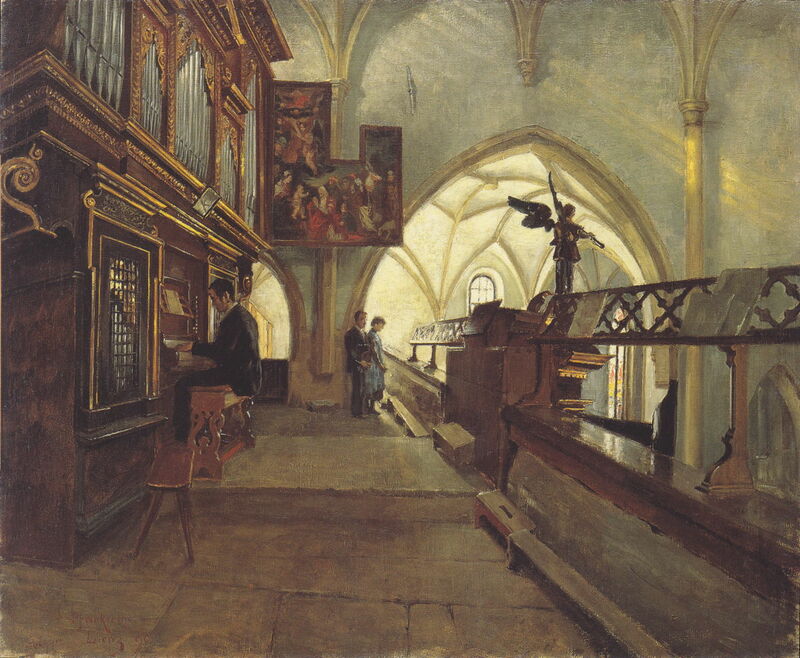 Egger-Lienz’s The Church Choir of Lienz Parish Church of St Andrä from 1890 may have been inspired by Henry Lerolle’s huge The Organ Rehearsal, which had been exhibited at the Salon in Paris in 1885. 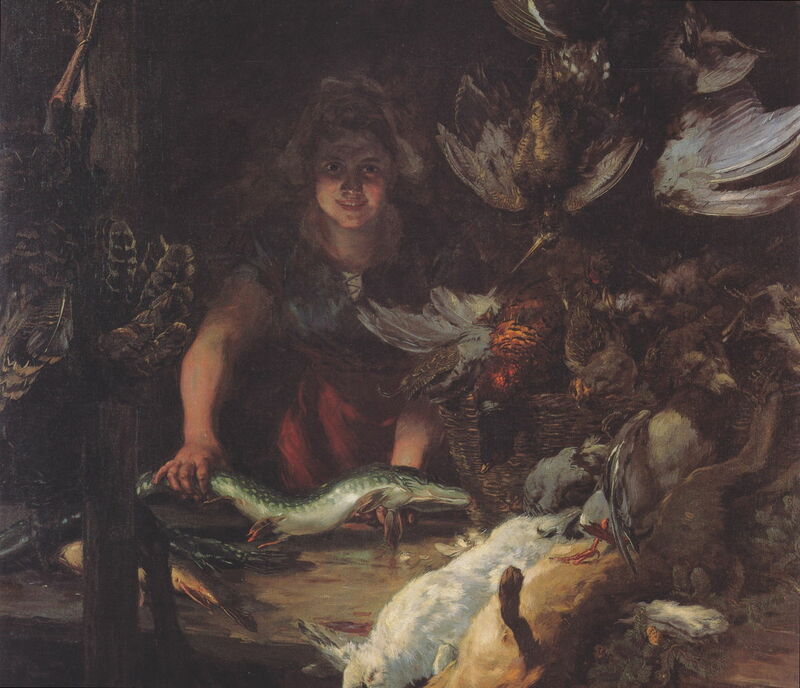 Its dominant perspective and detailed realism are suggestive of Naturalism, which was popular throughout Europe at the time. Albin Egger-Lienz (1868–1926), Farm in Grafendorf (1890), oil on canvas, 68 x 88 cm, Schloss Bruck, Lienz, Austria. Wikimedia Commons. 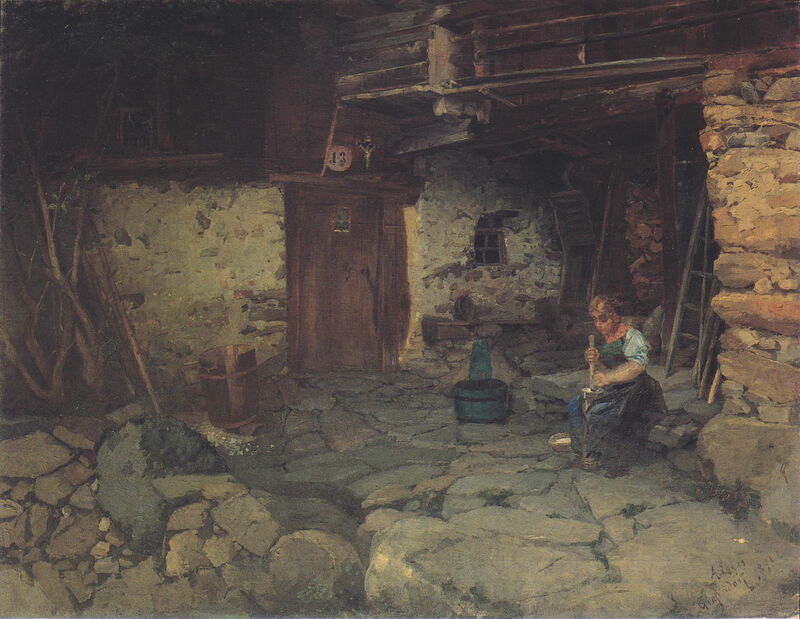 Farm in Grafendorf, also from 1890, shows the deeply rustic conditions on a farm in Styria, Austria, as a young woman sits churning butter on a stone platform in a dilapidated barn. Albin Egger-Lienz (1868–1926), The Portrait Painter in the Countryside (1891), oil on canvas, 140.8 x 175.6 cm, location not known. Wikimedia Commons. 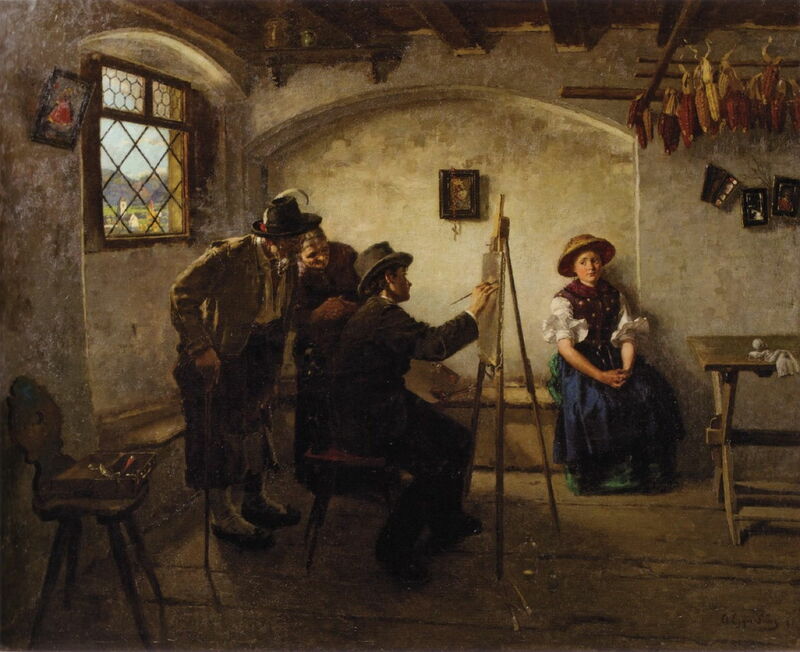 Although not described as such, I suspect that The Portrait Painter in the Countryside (1891) may have been a self-portrait of Egger-Lienz at work, painting the young woman who is seated rather tensely to the right. The cameo view through the window suggests that this was also painted in the Austrian Tyrol, or perhaps in Bavaria. Albin Egger-Lienz (1868–1926), A Farewell in the Tyrol in 1809 (1894-97), oil on canvas, 95 x 78.5 cm, Museum Schloss Bruck, Lienz, Austria. Wikimedia Commons. The year 1809 was a troubled time in the Tyrol, when Napoleon re-occupied Vienna and Austria was defeated at the Battle of Wagram. Much of the Tyrol was taken to form Napoleon’s Illyrian Provinces, and Austria was in effect a French possession. This triggered a series of popular revolts. The Cross (1898-1901) was one of Egger-Lienz’s most successful paintings of his early career, for which he was awarded the Grand State Medal in Gold when it was exhibited at the Künstlerhaus in Vienna in 1901. This too refers to the period of discord during Napoleon’s occupation in 1809. Here, a Tyrolean Capuchin priest, Pater Joachim Haspinger, is leading a peasants’ revolt against the occupation. 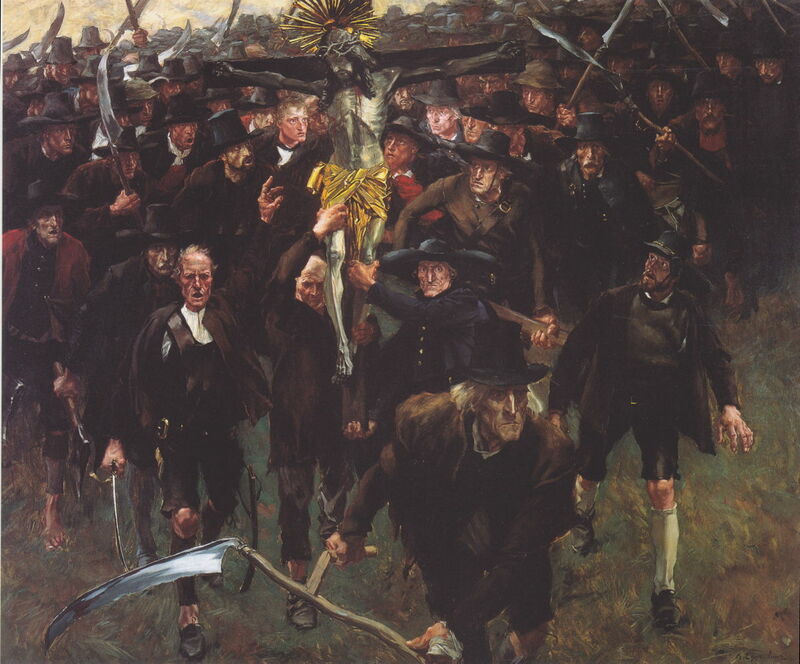 Haspinger appears to be the man in a broad-brimmed hat in the centre of the painting, holding aloft the large crucifix to the left of him. He is surrounded by a dense throng of country men armed with scythes and the occasional old sabre. Egger-Lienz shows what is clearly a very angry mob. Inevitably, perhaps, Haspinger’s revolt failed, and he was forced to flee to Switzerland. He eventually returned to Austria, and died an old man in 1858. Albin Egger-Lienz (1868–1926), The Venison Dealer (1902), oil on canvas, 171 x 143 cm, Museum Schloss Bruck, Lienz, Austria. Wikimedia Commons. In complete contrast, Egger-Lienz’s The Venison Dealer from 1902 is a portrait of a young woman with a radiant smile, surrounded by a rich still life of game, but not a sign of any venison. Albin Egger-Lienz (1868–1926), Christmas Eve (1903), oil on canvas, 95 x 95.5 cm, Museum Schloss Bruck, Lienz, Austria. Wikimedia Commons. 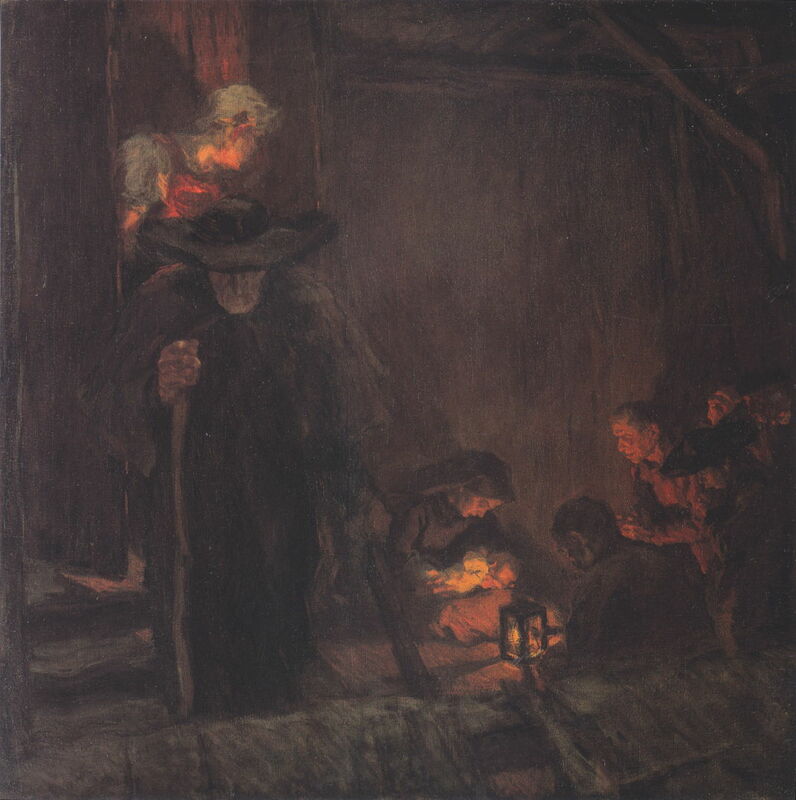 Christmas Eve (1903) is an effective re-interpretation of the traditional adoration of the shepherds, apparently set in a Tyrolean cowshed, with skilful use of light. This and the next two paintings mark Egger-Lienz’s transition to a looser style, which also appears to have been influenced by the social realist paintings of Jean-François Millet. Albin Egger-Lienz (1868–1926), The Tyrolean Waitress (c 1903), oil on canvas, 52 x 43 cm, Museum Schloss Bruck, Lienz, Austria. Wikimedia Commons. 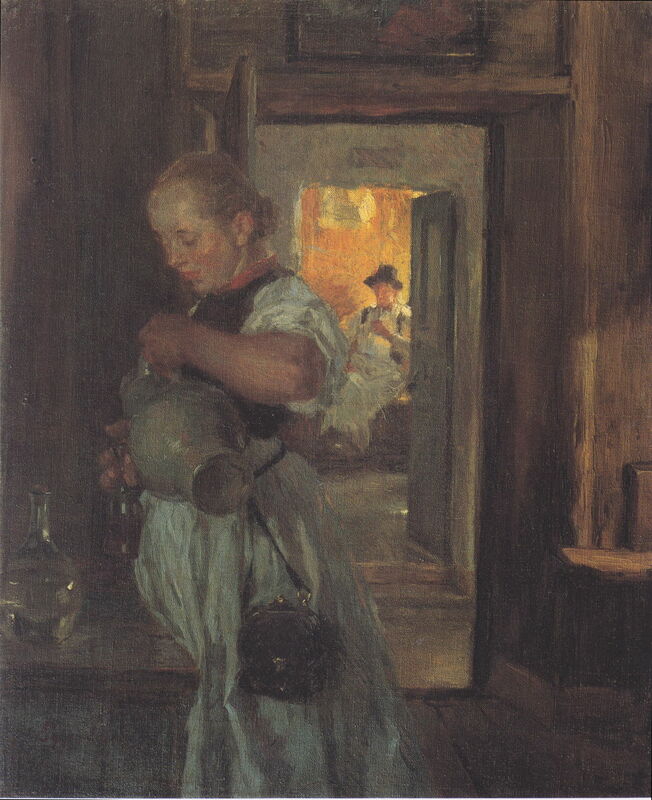 The Tyrolean Waitress (c 1903) shows a young woman pouring a drink for a customer, who is seen smoking a pipe in the well-lit room behind. Slung from a thin leather belt around her waist is her black leather purse. Albin Egger-Lienz (1868–1926), The Sower (1903), oil on canvas, 177 x 156 cm, Museum Schloss Bruck, Lienz, Austria. Wikimedia Commons. 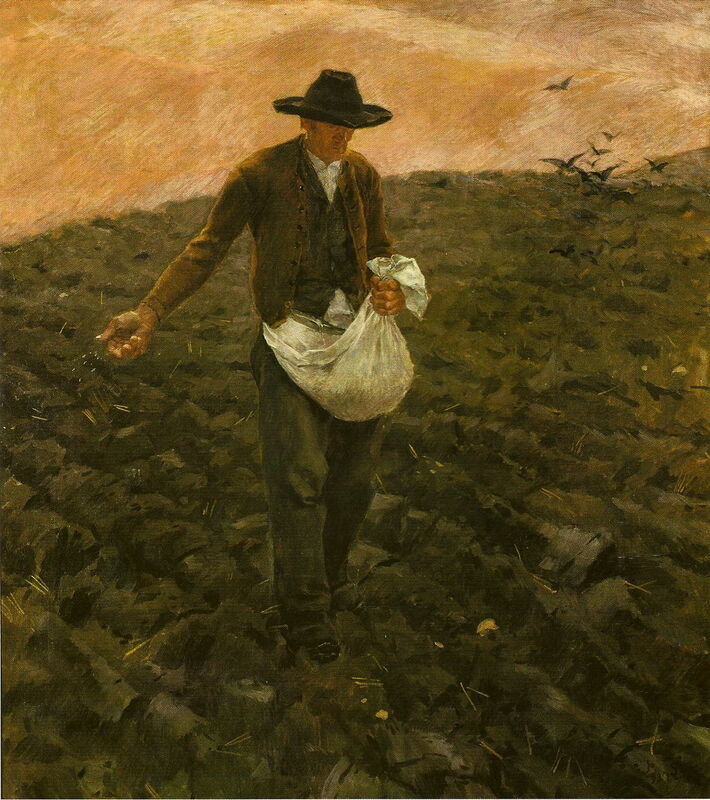 Millet’s influence is most manifest in one of Egger-Lienz’s first versions of The Sower, from 1903, a motif which was to recur in the artist’s later works. The earth colours, increasing looseness, and emphasis on simplicity were to set the style for much of the rest of his career. Egger-Lienz hated being accused of being a follower of Hodler, seeing him more as a competitor than ally, but his first exposure to the paintings of Hodler in 1900 marked a turning point in his work. Posted in General, Life, Painting and tagged Egger-Lienz, Hodler, Lerolle, Millet, painting, Secession. Bookmark the permalink. 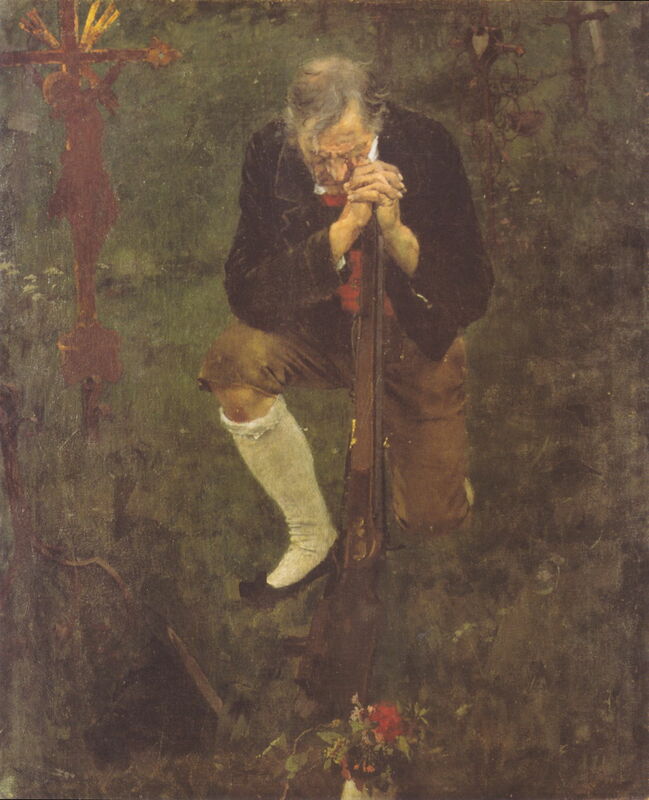 The man in A Farewell in the Tyrol is holding a rifle, maybe a shotgun, but not a spade. Perhaps the farewell is his own. Thank you: I think that you’re right. It is very hard to see from the image, but it does appear to be a crude, local-made shotgun. I’m not sure about its purpose, though. He’s definitely in a Tyrolean cemetery, and there’s clearly a pit at the lower left of the painting.